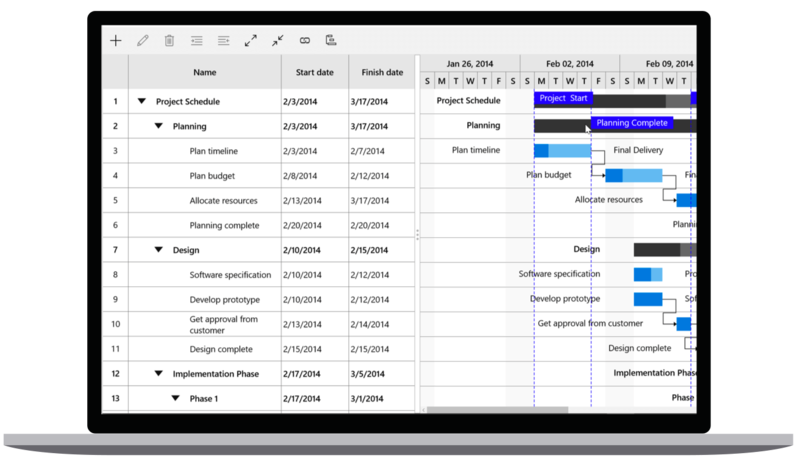 The UWP Gantt control provides a Microsoft Project-like interface for scheduling and managing projects. Its intuitive user interface lets you visually manage tasks, task relationships, and resources. Columns can be sorted based on a single column. Different timescales such as minute, hour, day, week, month, and year views can be configured. Able to highlight a task in the UWP Gantt. Customize the default view of the tasks in the UWP Gantt chart view. The toolbar contains options for editing, expanding, collapsing, indenting, outdenting, and deleting selected tasks. It also contains options for adding new tasks. Localize the content to any specific culture.